One inescapable fact of military life is rank has its privileges. At sea, it means that the ship’s captain has a single room while the lowest-ranking sailors may live a dozen to a room or more. On land, the privilege of rank can translate to hundreds of thousands of dollars of taxpayer money spent each year on rent as illustrated in a June Pentagon report highlighting 32 leased homes for senior officers. One is in Coral Gables, Florida, that the military spends $106,200 each year to rent. It is occupied by the four-star general leading Southern Command, which oversees South America. Some other lodgings are huge, historical villas. In Naples, Italy, the home of the admiral in charge of Naval forces in Europe has enjoyed a 5,624 square foot villa the government has rented at $180,000 a year since 2010. The commander of U.S. military forces in Europe is based at a 15,048 square-foot historical residence built in Chievres, Belgium in 1892. While the residence is provided rent-free, annual costs, which include security, are estimated at $117,000 a year. Other expensive residences are in Germany and Japan. “There is no question this is really a place where you see almost no expenses are limited when it comes to general officers,” said Danielle Brian, executive director of the Project on Government Oversight. “The trappings that come with the houses – the chefs, having enlisted people helping with their landscaping and you know a posse essentially of drivers. These are big expenses at the taxpayers’ expense,” Brian said. The 32 homes in question were identified based on reporting requirements issued by Congress. The Defense Department recommends no change in 10 arrangements. Another 14, including the Florida house, will be reevaluated with the goal of reducing costs, possibly through alternative housing. The report also recommends seven homes be replaced through alternative options like a housing allowance. The lease for the villa in Naples is scheduled to be terminated. All service members, from private to general, can be eligible for housing allowances depending on factors such as where they’re stationed. This is not the first issue the military’s highest echelons have faced in recent months. There has been growing criticism that it is becoming more and more top-heavy, increasing the ranks of three- and four-star generals by as much as 20 percent since 2001, according to one analysis. The military has at the same time been looking to significantly reduce its enlisted ranks in order to develop a more nimble force after the wars in Iraq and Afghanistan. According to the report, generals and admirals who have at least one star living in government-provided housing are entitled to “a 4-bedroom house with a minimum area of 2,600 gross square feet (GSF), and a maximum area of 4,060.” If that officer has what’s called a Special Command Position, the maximum square footage jumps to 4,466. Military pay is based on a combination of time and rank, with a one star general or admiral with at least 20 years of experience earning $15,913 a month, according to the Pentagon’s finance and accounting service. The evaluation of senior officer housing comes amid a significant belt-tightening by the Defense Department after the automatic budget cuts known as the sequester went into effect in March. Secretary of Defense Chuck Hagel, himself a former enlistee and Vietnam veteran, has slashed the budget of senior Pentagon officials by 20 percent. Speaking at the annual convention of the Veterans of Foreign Wars on Monday, Hagel said that every dollar spent for large facilities and other amenities “is a dollar that we don’t have available,” for training and readiness of the Armed Forces, he said. While not specifically talking about officer housing, Hagel said that “we must find savings everywhere in our budget,” trying to find every penny that could be used to keep the military ready to fight. Personally, I have no problem with this. A Four Star General should have a beautiful home and security. He or she is essentially a CEO of massive manpower and equipment to manage. No easy task. I even say this as a Democrat. The only guys worth their pay are listed above! Reduce pay and lifetime benefits for Congress leave these guys that put their lives at risk and command our soldiers alone. The ridiculous waste of Congressmen salary is insane and they typically have other jobs and collect all type sickening monies for making deals w corporate America. Im am not a member of the Armed Services but my opinion is all enlisted men should be paid double what they receive w more benefits of Congressmen for sure not to mention the Officers who spend their whole lives / careers caring for our safety and fighting our wars. Who cares what their housing cost don't you think they should be secure to the utmost ? 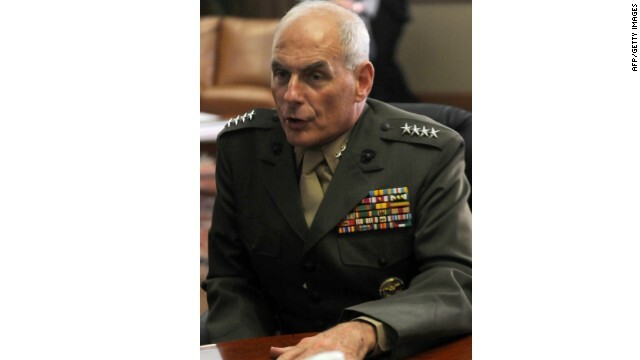 Firstly, the guy in the photo is GEN John Kelly, not John Allen. Secondly, GEN Kelly's "magnificent villa" is actually a pretty ordinary house in an above average neighborhood. It is NOT as large as he is allowed, and it is certainly not even close to the size of many other houses in the area. GEN Kelly's level of responsibility, if he were in the private sector, would allow him something much, much nicer. Thirdly, there is no housing on post in Miami, for anyone. This article is especially wrong because he is the most cost-conscious General I've ever met - and I've known dozens of 'em. All you people who begrudge any commander a few thousand dollars (yearly) for coffee and snacks to iron out an agreement or fix a misunderstanding, think about the millions and billions we have spent in other places killing folks. Is that a better use of your taxpayer dollars? I'm glad we give our generals lavish mansions. They can take our taxpayer money and do whatever they want with it. They should spend some money buying stuff from my contracting company so that we can defend our nation better. I sell screws and tools. I sold a screw to the government for about $100,000 once. But it was a special screw that only we make. AND it was a special express order. PLUS, my friend, a general, said I could bill the government whatever I wanted. I'm working with the government to make Laws that say every tool that the army uses need to have these special screw holes. My screws are patented and they are really good. Um, that's Gen. John Kelly in the photo. And also get rid of "Officer's Clubs". Generals can pay for their own housing, they make 90k-450k. Plenty to live on. altho, I wouldnt say they dont earn the money, god knows i wouldnt want responsibility for entire regions of troops, or entire baes full of men,women. some having as many as 90k people, like camp lejeune. Fewer generals, more trigger pullers. What we need is for congress would insist that no combat units be disbanded. What ever cuts take place can only come from the bloated higher ranks. (which I used to be a part of.) Every colonel and general cut would save dozens of privets who actually preform a mission. Murf, you were once a part of the "bloated higher ranks"???? You should have used some of your bloated higher pay to study some English Grammar and Spelling that you didn't quite catch on to while in the coillege that you supposedly went to prior to getting into that higher ranks position. Do you mean, "MacDIll Air Force Base?" I don't believe there's a military installation called "Fort MacDill."